For millions of Americans who were underwater on their mortgages, the tide is finally receding. That's good news for the housing market, of course, and for the U.S. economy as a whole, as housing is a major engine of the economy. Housing not only generates construction jobs, one of the hottest job sectors in the country right now, it also sparks spending on home furnishings and appliances. And as home prices increase, people feel more wealthy and tend to spend more. The number of homeowners underwater – those who owe more on their mortgage than their home is worth – dropped in the first quarter to 25.4% percent of all mortgages, or 13 million homeowners, from 31.4 % a year earlier, real estate researcher Zillow reports. Getting out from under debt and building enough equity enables homeowners to sell their homes and buy more expensive ones, which in turn boosts the housing market. 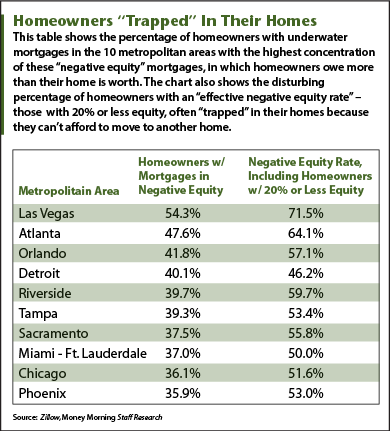 But many of those who are no longer underwater – known in real estate circles as "negative equity" – still don't have enough equity in their homes to put them on the market and move into another home. Zillow says these homeowners, with 20% or less equity, have "effective negative equity" – and they comprised 43.6% of all U.S. mortgages in the first quarter, down from 48.7% a year before. With many of these homeowners effectively trapped in their homes, the shortage of inventory of homes for sale continues in many markets, driving up prices, but often not enough – yet – that these homeowners can sell for enough to enable them to move. With hardly any equity in their homes, despite the rising prices, homeowners also are frozen out of refinancing their mortgages and lowering their interest rates and monthly payments. That means they don't get a chance to put more cash in their pockets and drive retail sales higher. "If they have less than 20 percent equity in their home, it really makes it extremely tough for them to sell their house, cover the transaction costs of selling the home and then have enough money left over for a down payment for the next house," Zillow senior economist Svenja Gudell told Money Morning. "To return to a completely normal market is very much a function of how quickly folks reach positive equity again," she said. Money Morning Capital Wave Strategist Shah Gilani agreed. "Until the rise of home prices readily exceeds the mortgaged loan value, it's all an 'effect.' It's not real," Gilani said. "The real measure isn't the rising number of homes becoming less under water; it's only real and only really going to impact the economy if those homeowners can sell their homes. Otherwise, the 'effect' is smoke and mirrors." But with the housing market recovering and prices rising, real estate experts note the number of underwater and nearly underwater mortgages has been on the decline, enabling many homeowners to sell their homes and move. As prices keep rising, the number of homeowners trapped in their homes will continue to decline. With interest rates looking to rise, the housing market may fall again. The baby boomers are past their peak consumption years in the housing market and the kids are too overwhelmed with auto, student loan, credit card, or all of the above debt to be first time buyers.. thus the natural cycle is broken now. Plus, in some areas of the country, there is still another wave of foreclosures that looks very possible when you look at the numbers. Home repair and improvement may continue to be strong industries as many find themselves unable or unwilling to sell given market prices, equity they have, and their current mortgage to propety value.